Last week Zachary wrote a great article about a recent spectra taken of Eta Carinae’s Great Eruption (an eruption which took place from 1838 – 1858!). 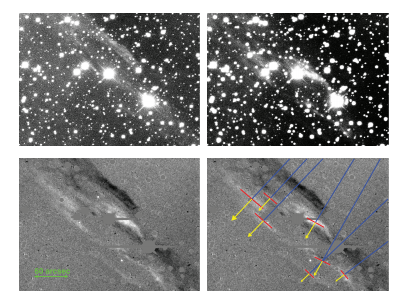 This extraordinary feat was made possible by a technique which examines light echoes from historic explosions (typically supernovae or outbursts of variable stars). The idea behind light echoes is (somewhat) simple, relying mainly on geometry, the relatively short duration of cosmic explosions, and the constant speed of light. When an explosion occurs in space, some of the light travels directly towards us, while most travels in other directions. If something (in our case astronomical dust) were to scatter this other light in the proper direction, it could eventually make its way to Earth as well. Now, since the speed of light is a constant, any light arriving at Earth today which originated at a given time and location in the past must have traveled the same total distance. Recalling from geometry class that the distance from one focus of an ellipse (the explosion) to the surface of the ellipse and back to the other focus (Earth) is a constant, we see that for any historic astronomical event, there is always an elliptical surface from which we at Earth could theoretically detect a light echo. An example of this is shown in Figure 1. In the past week, I have given this explanation to several friends and they have all asked me a very valid question: “Wait a minute, how do we know that something is a light echo, and not just a source in a different direction?” What follows is a brief description of how astronomers identify and interpret light echoes. Identification & Direction: The initial identification of light echoes hinges on the fact that the elliptical surface from which we can detect echoes moves with time. As the time since the initial explosion increases, any light we detect must have traveled a longer distance to reach us, and the scattering surface must therefore be located further from the initial explosion site. Thus, astronomers attempting to detect light echoes obtain several images over a timescale of years. Any one image alone cannot be used to identify a light echo, but by taking the difference of two images, astronomers can identify bright blobs or arcs, which move with time. By examining several images, the direction of motion (and therefore direction back to the initial source) can be identified. 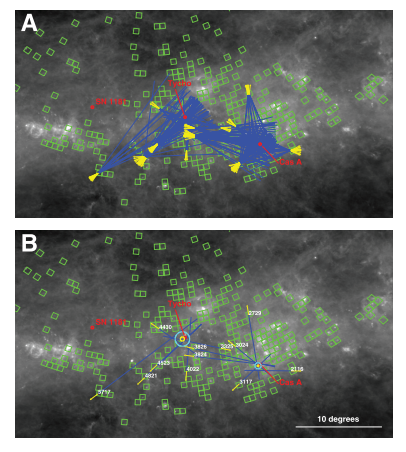 Figure 2 shows an example of this process in a region around the Tycho supernova remnant. The top panels are two images of the same field of view taken a year apart, and the bottom panels represent the intensity of the second image minus the intensity of the first. Bright spots in the lower panels represent areas which a brighter in the second image and dark spots areas which were brighter in the first. The lower right panel is the same as the lower left but with light echoes (red lines), their apparent motion (yellow arrows) and the inferred direction back to the source (blue lines) identified. Now, of course, the direction in which these light echoes appear to move can be affected by the size and orientation of the dust cloud which is scattering the light. However, assuming the orientation of dust clouds at different locations are not correlated, the motion of different light echo blobs in the same general region should still on average point back towards their source. An example of this averaging process, which identifies several light echoes with the Tycho and Cassiopeia A supernova remnants is shown in Figure 3. The green boxes designate the locations the authors searched for light echoes. Duration of Event: Once light echoes have been tentatively identified, the structure of the echoes themselves can be used to put additional constraints on the explosions that caused them. For instance, the width of the echo (along the axis pointing toward the source) is related to the duration of the supernova or outburst, with the portions of the echo lying closer to the source coming from light emitted later in the explosion. Although this effect is complicated by the properties of the scattering dust and the fact that we observe a projection of the true light echo, astronomers can roughly relate the apparent motion of a light echo to the duration of explosion. For a light echo of a typical supernova (which only last a few months) one year between images is usually sufficient for there to be no overlap between the old and new position of the echo. In the recent paper on the light echoes of Eta Carinae, the authors still observed a partial overlap of the new and old position of a particular echo in images separated by eight years. They use this fact to argue that the echo must have come from the Great Eruption (which lasted ~20 years). Light-Curves & Magnitude Variations: In a complimentary technique, astronomers can examine the brightness of a particular point on the sky (as a light echo passes through it) to reconstruct the light-curve of the initial explosion (at least in a relative sense – the echoes are not as bright as the initial explosion). In the case of Eta Carinae, the authors find that the source brightened by at least two magnitudes over the course of eight years. From this they concluded that they light curve could not be due to another historic eruption of Eta Carinae (which occurred between 1887 and 1896), during which records indicate the star brightened by only one magnitude. Spectra: In the end, one of the ultimate goals of identifying light echoes is to obtain spectra. As described by Zachary last week, spectra from light echoes offer us the unique opportunity to properly classify and interpret historic explosions. Additionally, they allow us to examine the properties of these explosions from multiple angles, a feat not possible by direct observations. 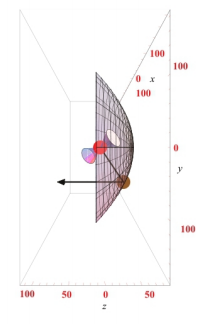 Techniques examining light echoes therefore have quite a bit of potential, although a point mentioned several times throughout this article must be reiterated: many complications in the interpretation of light echoes can arise from uncertainties in the orientation and thickness of the dust which created the echo. In many cases detailed modeling is required for robust interpretations. “Even at midday did a wandering people gaze upon a bold star . . .”: Historic Supernovae A Brand New Way to Determine Hubble’s Constant A Supernova Silhouette SN1997bs’s True Identity: Impostor or Not?